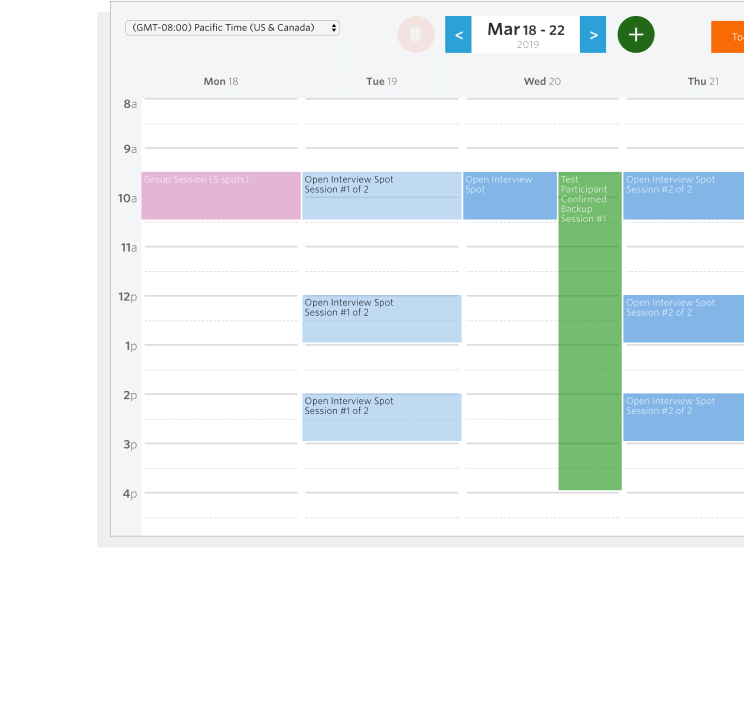 Control your scheduling workflow in Ethnio. There is a gold mine of options to modify and manage all types of scenarios and participant touchpoints throughout the scheduling experience. Are you in charge of making sure scheduling is efficient? Track no shows, cancels, backups, and more. One of the goals of our scheduling platform is for coordinators and ResearchOps teams. Every study, every payment, every survey, every invite, every opt-out. Across your whole team. The core of scheduling is sending emails to your potential participants. Ethnio allows you to customize the sender, the from, and all the text. You can also customize every associated landing page and even the buttons on those pages to match your tone and branding. Motivate your participants across all studies by sending out reminders at the moment they need it. Set-up emails, text messages, or even robocalls, to send out as it gets closer to the time of the interview. Have all your research sessions show up in your calendar automatically in any major calendar platform. You can also send calendar links to your team so they can receive automatic updates. If you’ve used other calendar tools like Calendly, which we love, you’ll know there’s no queue for you to choose from multiple potential participants for any given time. With Ethnio, you can use Picky mode where nobody is confirmed. Or switch to Fast mode and let our algorithm automatically choose the best participants for you. Everything your organization needs from pen tests to service level agreements. Let them rate and comment on your potential participants according to your own custom scale. Hi #ResearchOps, this one is for you. How is this different from the feedback feature above? This is for security, reception, or anyone else on your team that needs a list of confirmed participants for any study or test day. Schedule from emails you send in the Pool or from web intercepts or from social media or CraigsList. Wherever you need to source participants, Ethnio lets you schedule them automatically.